I entered 2019 with no word of the year. No intentions. This might have been an attempt to try and not hold on too tight, to keep the pressures of life at bay. But mostly, it was a reminder to trust yourself, trust the process and be fluid. To find your inner light, be your best self and let each day flow from one to the next. I am surprised how magnetically things are taking shape and how in control I am, by not holding on too tight, and keeping things fluid. With plenty of room for the unexpected and serendipity, so far this month I have taken a short weekend trip to Aberdeen, submitted an article to a magazine I've been wanting to write for since a long time, attended a wonderful evening of cocktails and canapés at the media launch of the dazzling new Soho Residence, started planning for my next two dance movement workshops, and drafted a short story for a creative writing competition. Being fluid has also helped me to do more, see more, and be more. 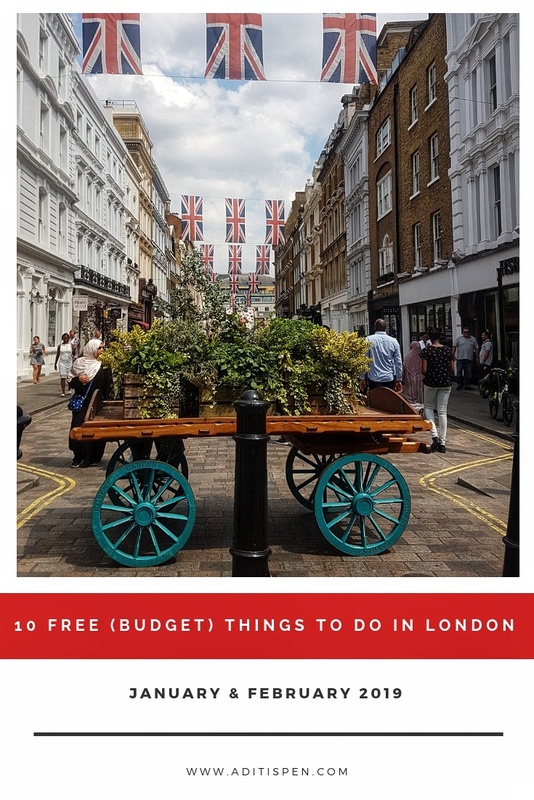 Here's a list of 10 free or budget friendly things to do in London that are in my diary. 1. The Toy Fair is the UK’s largest dedicated game and hobby event and houses the hottest and most anticipated products for the year ahead. I am looking forward to the press day today and can't wait to explore the exciting world of toys. 2. Celebrating Women Writers – A Discussion on Modern Journalism with Creoate. 24th January marks the 90th anniversary of Agatha Christie’s novel ‘The Seven Dials Mystery', and Creoate is celebrating the day by giving platform to women voices in the space of writing, digital content marketing and entrepreneurship. Can't wait! 3. On 26th, I'll be joining the Gather ladies for a much needed spa afternoon. I was really bummed to have missed out on our catch up at the Gather brunch last Saturday, as I was nursing a monstrous migraine. So I am really excited to gallop through this week and unwind with my favourite ladies. 4. Secret Canal-Side Wandering with Saira from Living London. If you know me, you'll know how much I love to wander about in the city and find London's hidden wonders. I have been wanted to attend Saira's walks for a long time. I've met her on two brief occasions and she is such a warm, modest and lovely human. Do check out her wanderings, they all are unique in their stories and spaces. 5. Ring in the 'Year of the Pig' by celebrating Chinese New Year with a foodie walk through Chinatown. If anyone wants to join me on this self guided foodie walk, do drop a message. I have few pan-Asian and regional Chinese eateries saved on my google maps that I can't wait to try. Every year the London Chinatown Chinese Association organize the most brilliant and vibrant parade, free stage performances and traditional Chinese food across the West End, from Shaftesbury Avenue in the north down to Trafalgar Square. Go check it out on 10th of February. 6. Good Grief, Charlie Brown! exhibition at Somerset House, features key themes of Charles M. Schulz’s life and work. I love the Peanuts: Snoopy, Charlie Brown, Lucy and the gang. The exhibition delves deeper into the the comic strip that debuted in 1950, and explores Schulz’s background and inspirations. 7. Storytelling with Vanessa Woolf - Vanessa tells traditional and non-traditional tales of all kinds, often drawing on the history and folklore of London. I attended her talk at the #citizensofLondon December edition and have been following her since. Looking forward to one of her storytelling sessions next month. 8. Orchid Festival at Kew Gardens is back again from 9 February until 10 March 2019, this time celebrating the diverse plant life of Colombia. Kew has created a beautiful surprise at every corner - colourful butterflies suspended from the glass ceiling, a cascade of colourful hanging vandas representing Colombia’s famous rainbow river, Caño Cristalesm, and much more. This will be booked over the weekend. 9. Ever since I attended the V&A Friday Late, I have been on the look out for museums that open late-night exhibitions. And here's Late at Tate Britain - A night exploring art and well-being, inspired by the work of Turner Prize winning artist Martin Creed. 10. And last but not the least, gotta go here for Instagram. I love churros; the only thing that can make them better is having them at an Insta-worthy dessert bar! The Knot Churros have recently opened and the space looks as delicious as their menu. I already know what I'm going to have...heading there soon. Thanks for reading. If you liked my post, tweet me some love, or come say Hi! on Instagram, or best of all Buy my Book. 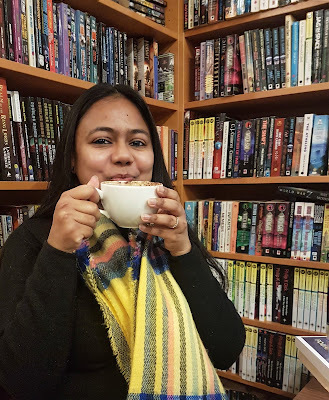 Aditi, so much to do in London! Wow, have a great time with these events and activities. I visited London, it's been many years, and I loved it. I guess it had something to do with the fact that we were a British colony once and have studied English literature and so was excited to see some of the famous landmarks/monuments which I had only studied or read about. But, I would like to do London again, the less touristy stuff and just wander in the cobbled streets and bylanes. BTW, loved the pin and pinned it. OMG I love the variety in there. Story telling and food walk and a toy fair - it all sounds so interesting. Sometimes I wish I could clone myself and be everywhere at the same time while also handling the work and chores and kids. Have fun Aditi and I look forward to your reviews. Many congratulations first of all, Aditi. Way to go! May you get many more brilliant opportunities writing in magazines. Thanks for sharing this amazing list. There is definitely so much to do in London. So much to do, I'm going to London next month to see a show and if I have time I definitely might try and check out the Orchid festival, its sounds beautiful!! I haven't been to London in a while, but there is always something happening! These events sound wonderful, I think the Churros place deffo needs a visit! Life is always better with a bit of churros in it isn't it? Sounds like you are getting your year off to a good start!